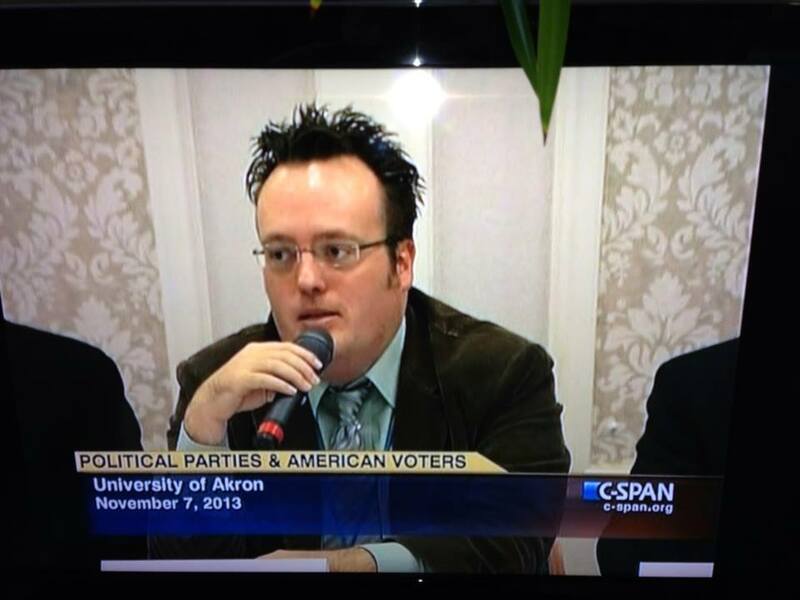 Clearly appealing to the non-bowl-watching supermajority of the American people, C-SPAN aired this New Year’s Eve morning the panel on partisan polarization from the 2013 State of the Parties Conference at the Ray C. Bliss Institute of Applied Politics at the University of Akron. As usual, John Green assembled a great meeting. Click here to watch the panel; I bat lead-off with my co-authored paper with Mike Ensley and Ted Carmines about why Americans can’t get beyond the left-right divide. The panel also includes two very interesting papers giving evidence for the idea that dislike for the other party is a driver of partisan polarization in the electorate. The first, from David Kimball, Bryce Summary, and Eric Vorst provided evidence that partisans are systematically likely to find that the other side makes them feel angry and afraid. Alan Abramowitz showed evidence of increasing negative affect for the other party as well; his analysis of the American National Election Study data showed that people’s placement of the distance between their own ideological position and the position of their party has not changed much but that the distance between their position and the other party has grown dramatically. The great Thomas Edsall, the New York Times columnist and professor of journalism at Columbia University, has a nice column featuring my research with Ted Carmines and Mike Ensley examining the consequences of a political system in which elected officials are divided along a single ideological dimension while the public is split across two. The Carmines-Ensley-Wagner analysis helps explain the roiling nature of contemporary politics, what they call “the deep-seated ideological heterogeneity” of the American electorate. The heterogeneity lying just under the surface polarization has led to two seemingly divergent developments. The relatively narrow voting groups that fit the traditional definition of liberal and conservative are entrenched in the two-party system — conservatives strongly sharing the policy preferences of the Republican Party and liberals strongly sharing the policy preferences of the Democratic Party — and the very depth of this belief creates the gap that defines political polarization. 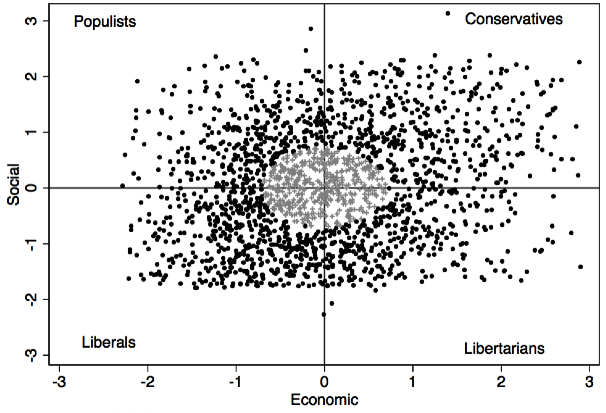 But there is another world of disaffection aswirl here too: populists and libertarians are disconnected from both parties, often cross-pressured issue by issue, with libertarians gravitating towards the Republican Party on economics and to the Democrats on social issues, while populists are propelled in the opposite direction. The figure that expresses the general logic behind the argument is below. We presented the paper at the State of the Parties Conference at the Bliss Institute at the University of Akron last month. The hyperlink in the previous sentence links to all of the paper presented at the meeting. The whole conference was very interesting.